Major events and celebrity appeals can raise awareness about climate risks, but without understanding how they will be uniquely affected, people and organizations face challenges either mitigating or adapting to risks. The segment highlighted the perils of sea level rise on vulnerable nations and cities, showed Ed Hawkins’ compelling visual spiral showing the rapid rise in global temperatures, announced that more than 11,000 trees will be planted in Rio, representing each Olympic athlete and finished off with a poem praising a flower that “has breached the asphalt, the ennui, the nausea and the hate”. The above is important for many reasons, not the least that it has the power to stimulate conversations and greater risk awareness. The dangers of ever more frequently-occurring natural catastrophes are increasing and very present in our society. And major events and personalities can help reach a wider audience with this message—it seems to be working. Comments by celebrities resonate louder with audiences than hard facts exposed by scientists. 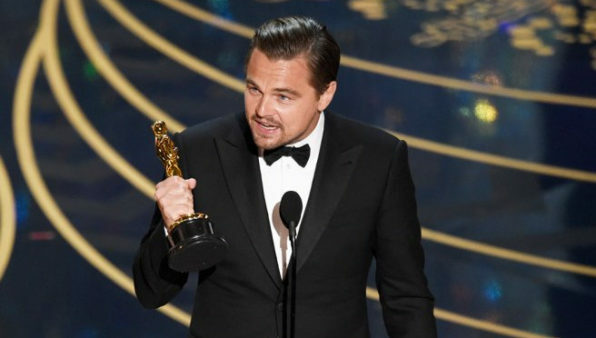 A paper published this month (August 2016) found that after Leonardo DiCaprio’s acceptance speech, tweets including the terms “global warming” or “climate change” increased by 636%. The same paper points out that the “Di Caprio Effect” eclipsed Earth Day and The Paris Climate Conference by factors of 5.3 and 3.2, respectively. Google searches for terms related to climate change or global warming also spiked by about 235% days after the speech. But the Hollywood actor is not stopping there, the Nat Geo Channel has acquired the worldwide rights to his untitled climate change documentary that presents an account, which will include interviews with Barack Obama, Bill Clinton, UN Secretary-General Ban Ki-moon and Pope Francis, of how society can prevent the demise of endangered species, ecosystems and native communities across the globe. While most people, organizations and governments recognize the enormous challenges ahead, the fact remains that understanding how each of us, our communities or employees will be affected by increasing climate risks is very difficult. Even when leaders and celebrities are able to inspire and stir audiences to action for moments in time, the fact remains that understanding how to take action based on scientific reports, data or projections remains very difficult—most people and institutions can’t relate these risks to their own lives and missions. That’s why Adapt Ready is devoted to making sense of the enormous amounts of big “climate” data out there so, when the next celebrity or major event highlights our global risks, we’ll all be better prepared to take action and not just worry. At Adapt Ready we have been raising awareness as well as developing analytics to help governments and enterprises manage their risk exposure. We understand sea level increase might have a higher focus because many people live in major coastal cities (Amsterdam, New York, London), but it is also important to understand that climate change and natural disasters have implications for national security, agricultural productivity, global water stress, diseases, population migration, and on. Get in touch and let us increase your business resiliency.